Decided to upgrade and renew my old Garmin GPS Golf watch as I felt like a change. Not that there was anything wrong with my old Garmin, but just because I fancied a change and perhaps take advantage of any improvements in technology gained over the last few years. I didn’t get another Garmin as the replacement models seemed a little expensive for my needs. I mean I don’t need a swing improvement meter (to check my back swing against my downswing) and all that stuff as I’m playing golf, not standing about wasting time checking my wrist all the time. A bit like the Professional Golfers these days who spend far, far too much time discussing with their caddies the wind characteristics, or which club to hit (what ever happened to “feel”? ), deciding what spin to impart, blah, blah and blah! Then as a result playing a rather mediocre shot as a result more often than not. Basically all I like is the distance I have left to the hole, the distance to the odd hazard between me and the green, so I can lay-up or fly over that bunker or stream and so on. It’s also a fact that amateur golfers are more often short on approach shots to the green, usually as they tend to over-estimate the distance they hit each club. The GPS watch solves that as you can measure each shot’s distance and find out just how far you actually do hit each club. Not surprisingly many golfers who used to boast 270 yards off the tee with the driver, end up with a serious reality check, as the GPS measures their drive at around the 200 yard mark! I used to play of a very low handicap myself and my drive here in the UK was around the 260 yards mark, which was pretty good considering the equipment at that time (1960 – 1986), was actually about UK Pro standard. Today being a very senior golfer with today’s new equipment I can sometimes manage a drive over 220 yards, but mostly around the 200 yards and my new GPS Bushnell Neo Ion watch confirms it as such. 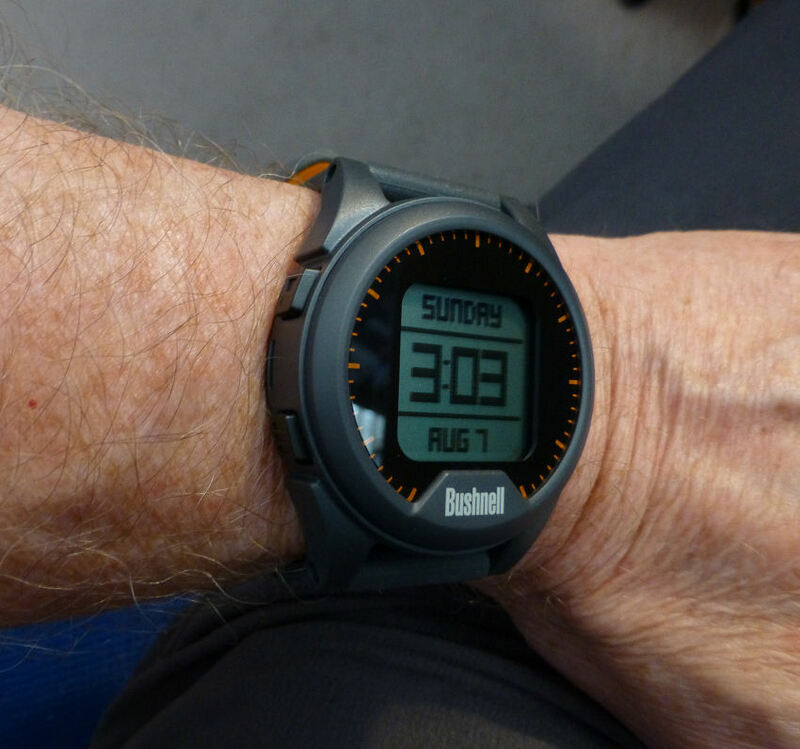 The Bushnell on the wrist, chunky but very comfortable. The watch is not the smallest around though it’s quite an acceptable size at just a shade under 45 mm diameter with a clear good contrast rectangular digital display. Quite chunky though at 15.5 mm thick it does however sit very well on the wrist owing to the very flexible silicon strap and buckle set up, which incidentally is VERY comfortable. I got the Charcoal color version with the Orange under/charcoal strap. The watch is also very light at a fraction under 50 gms, so you hardly know it’s there. It is VERY easy to use even though it has 5 push buttons to play with. Lower left is the Menu button which gives you scroll options such as Pedometer, Odometer, Stopwatch,Timer, Alarm,Battery and Settings. The right hand 3 buttons are upper right – move up, lower – move down and the center button is the Select function button. Flat back with recessed charge terminals allows easy connector fit for charging. To start a golf round push the upper left and select Play Golf on the display – it will then seek a signal (about 3 minutes or so depending on location) and it finds the courses near you. Select the one you are on – it will then load the course data and you are good to go. The Bushnell also has a tricky feature that I find rather useful called Tee time. You select the day and the time (within 7 days) of your next game. 7 Minutes prior to your Tee Off time, it switches itself to Golf Mode, seeks the signal, sets your course and basically as you step on to the tee, it displays the correct course and the 1st hole yardage is there ready for you. If it’s a shotgun start competition, the GPS function will track your position on the course, indicate the hole you are on with the data you need. It works very well and is a really nice feature and far more useful than some swing analysis function that I simply don’t need. 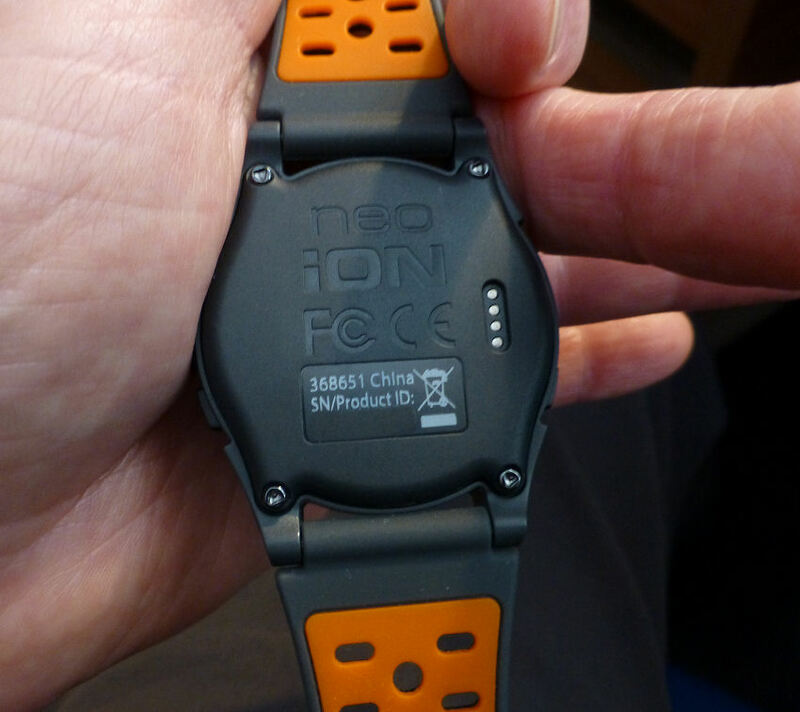 Very flexible silicon strap with contrasting orange underside. This is the Charcoal color version. The hazard indication of each hole I suppose could be better served with the symbol idea of the Tom Tom watches, as the Bushnell simply describes the hazards as abbreviations, which whilst you’ll soon get to know them, took me a few guesses to get right the first few times I tried it. The yardages to and over the hazards is however as accurate as any and very useful, especially as now with your GPS watch you will now how far you hit the ball any of your clubs! (assuming you DO hit the ball of course!). Oh yes I forgot to mention you can, with a simple push of a button, measure your shot distance. Main menu gives scroll options – the right upper and lower buttons control the scroll. The watch manages around 3 rounds of golf and if not playing golf/using the GPS function it will act as a watch for around a year which is rather better than most others.. 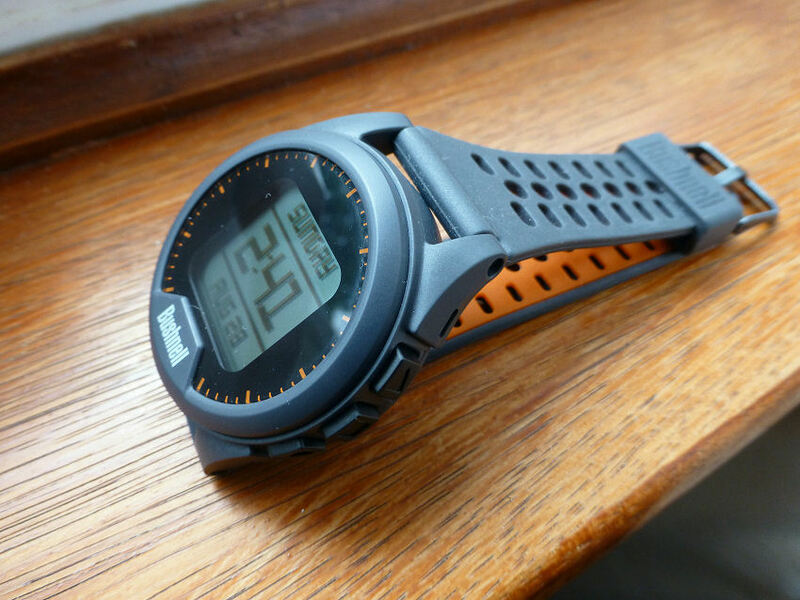 It is easily charged with it’s supplied charge cable (USB ended) and connects to the watch with a clip on back plate, which fits over the back and connects to the terminals on the watch back. This fitting is not as fiddly as either the Garmin or the Tom Tom and simple to use. It only takes a few hours and the watch is charged ready to go. I have to say I’m pretty pleased with it so far, certainly in use and practicality. Also the price is more affordable in comparison to most of the opposition I’ve seen. 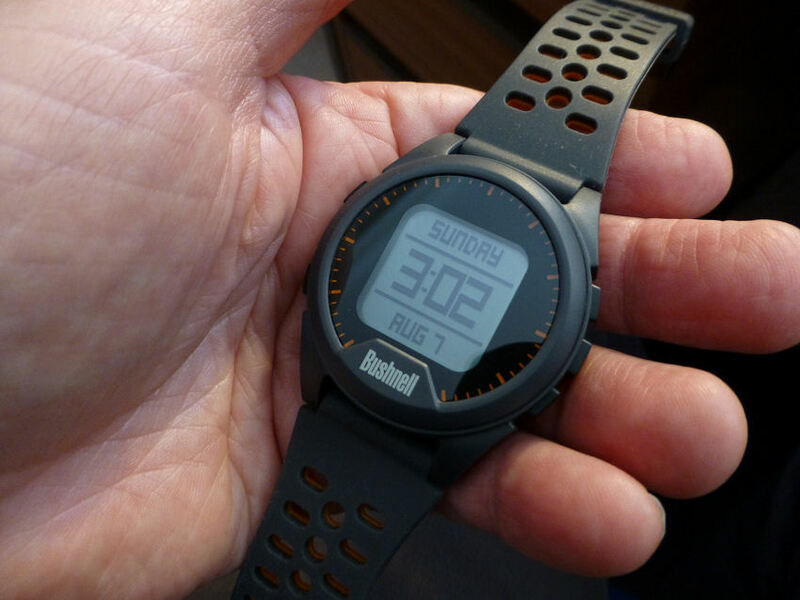 It’s also nicely unobtrusive and understated on the wrist and though hardly noticeable it does the job very well. Yes – for me it has been – I like it, it works well, I can easily see it and it’s simple and easy to use. And has my golf improved? Well that’s more tricky to answer, though I’m now certain my drives are 200 yards not 260 yards and the fact I know how far I hit my new irons is a bit of a revelation – so I’m optimistic that the golf will improve – in fact I’m sure it will and surely that’s got to be good! 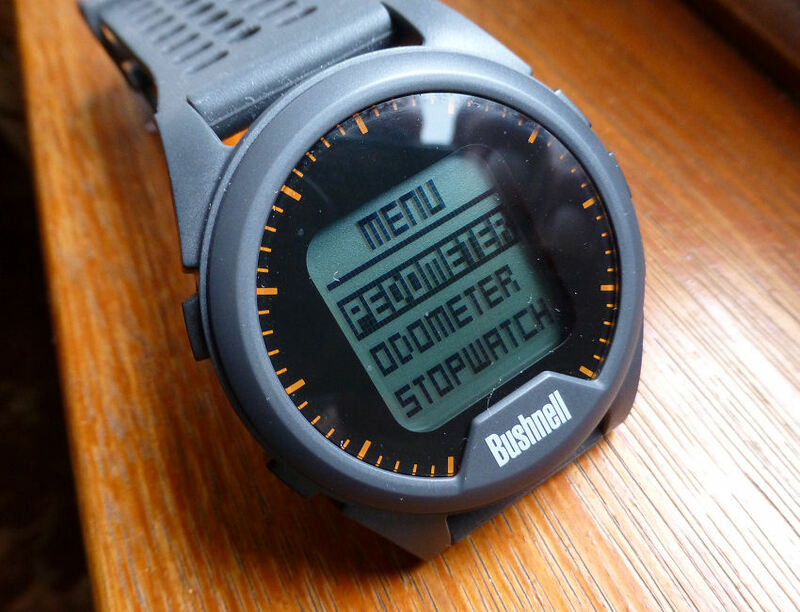 This entry was posted in Watch reviews and tagged Bushnell Neo Ion, Golf GPS watch. Bookmark the permalink.